Criminals are criminal they don’t have any religion, caste and creed, they don’t follow humanity and they will be in clutch of law said Capital SP M Harsha Vardhan. SP said that we are working on it and the police officers from Naharlagun Police Station are working round the clock to get the clear-cut information about the accused. However suspicion have been made on several person but we are looking for clear clue and have detained several persons in this regard. Demonstration and protest will distract us from the focus investigation that is currently going on. He said we are putting all out effort to arrest the culprit behind the death of wife while grievously injuring the husband near Pachin village at an agriculture field on Wednesday wee hours. However report from Laluk said that on Thursday hundreds of members from Kissan Mukti Sangram Samiti and Chhatra (Students) Mukti Sangram Samiti burnt the effigy of Arunachal Pradesh Chief Minister Pema Khandu and Assam Chief Minister Sarbananda Sonowal demanding arrest of unknown miscreants within 24 hours and Compensation amount for the victims family of late Aisha Khatun and Md. Ramzan Ali who is taking treatment with grievous cut wounds. The demonstrators further threatened for complete road and economic blockade from Gohpur ,Hollongi, Banderdewa, Kimin, Likabali, Jonai, and Ruksun respectively. Talking to local media, the protester said that such incident have already been happened previously against innocent people of Assam. The people here in state capital are in tremendous pressure and they are in apprehension that any untoward incident could happened to the commuters travelling in vehicle registration with AR and others through Nobocha – Borsala, Laluk, North Lakhimpur region. SP further said that he have discussed the matter with his North Lakhimpur counterpart and appeal all to maintain peace. 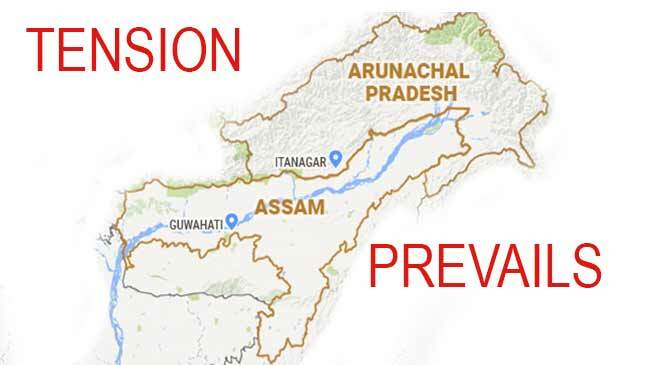 People of Assam should remember that, there own people are residing in Arunachal Pradesh’s capital Itangar.They can’t just block every where.